CARACALLA is located in the historic Heights area of Little Rock, Arkansas. The area is famous for its fine shops and restaurants. CARACALLA is Little Rock's first full service spa. 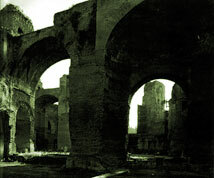 The original Baths of Caracalla were begun by Septimius Severus in 206 and inaugurated in 217 by Caracalla. Depending on the source, the Baths of Caracalla could accommodate 1600 to 3000 bathers. The Baths of Caracalla were named for the Roman Emperor Caracalla who was 22 years old when he became emperor of the Roman Empire in February 211. We can't accommodate 3000 bathers at one time but we do have a full service spa and a full line of natural cosmetics, lotions, shampoos and conditioners as well as special oils and spa supplies.